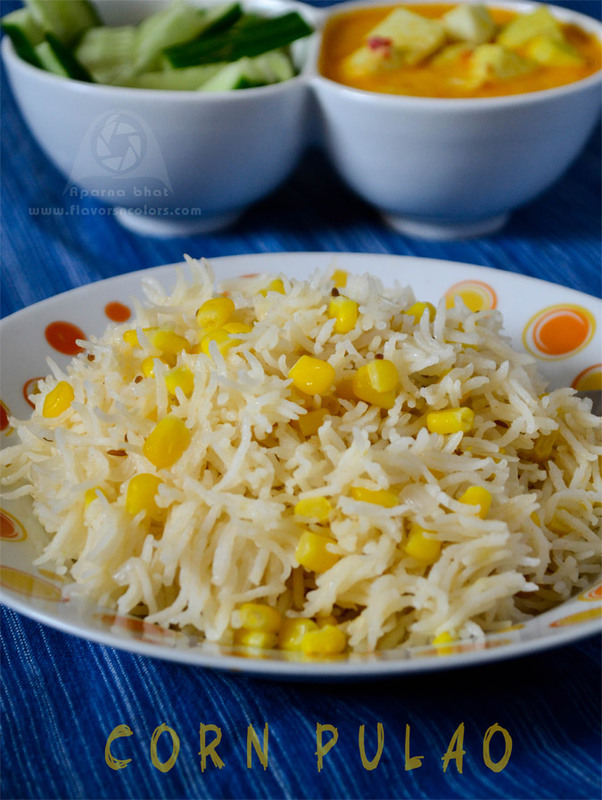 The below pulao is an easy rice recipe loaded with sweet corn. A complete meal by itself if you prefer one pot meal than you should try this. Its actually a recipe for Cauliflower pualo by Mrs. Mangala Barve, author of cook book "Annapurna". I tweaked her recipe by substituting cauliflower with sweet corn and adjusted spices to suit family taste. Hope you enjoy it, if you want to check other rice varieties click here. Wash and rinse rice. Soak it in water for 20 mins. Drain the water and keep it aside. Heat oil in a deep bottomed pan. Add cumin seeds and as they crackle, add bay leaf, cinnamon, cloves and peppercorns. Stir fry for a minute. Add crushed green cardamoms, finely chopped onions. Saute it till the onions turn pink in colour. Next add in ginger garlic green chili ground mixture and stir fry till the raw smell disappears. Mix the sweet corn, drained rice and saute it 2 mins. Add hot water [find the ratio of rice to water as per mentioned on basmati rice packet]. Allow the rice to cook in boiling water. After 5 mins simmer the flame and cover the pan. Add red chilli powder, salt to taste, stir it once and continue cooking until the rice is done. Switch off the flame. Serve it with salad and paneer/palak side dish or any north Indian side dish of your choice. I love corn but never tried it in rice. Rice tuned out good, perfectly cooked and grainy. Yum! 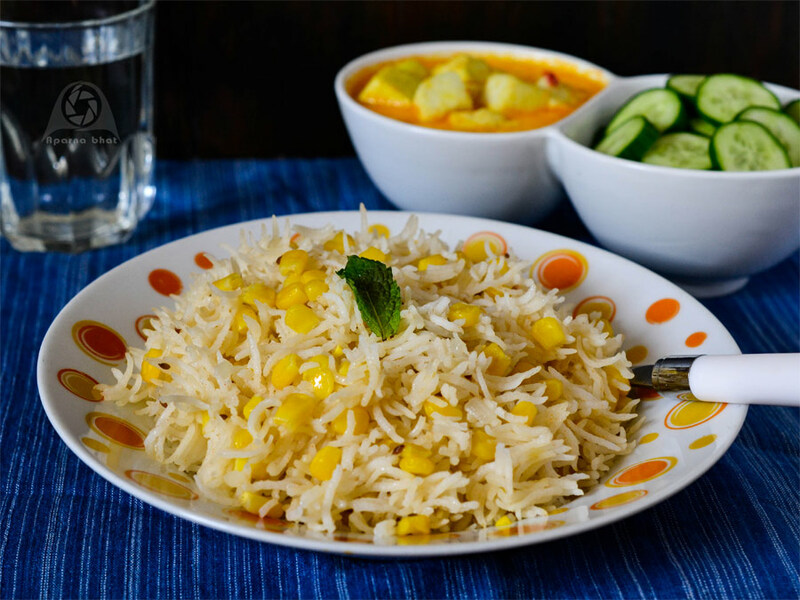 Very inviting and definitely a flavourful pulao. What a simple, yet flavorful one pot dish. nice recipe, hope to apply it using rico rice.